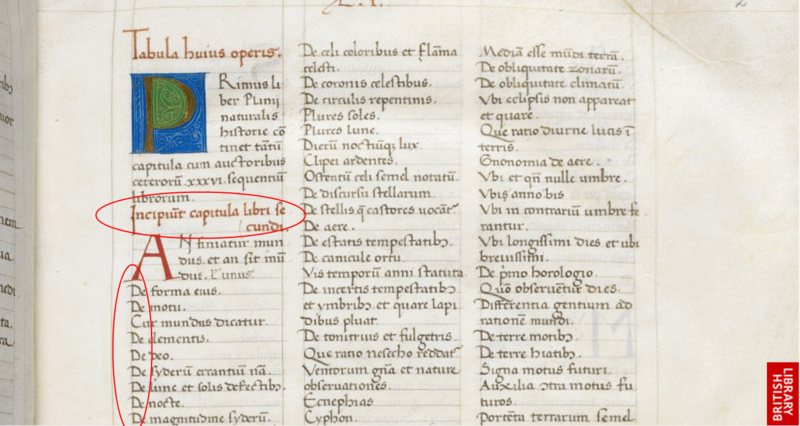 With the new availability online of images of the British Library ms. Harley MS 2676 (Pliny the Elder, Historia naturalis, Florence, 1465-1467), we can now investigate just how the chapter titles are presented in a manuscript. Technical note: there seems to be no way to link directly from here to the pages in question. Ideally I would link the images below direct to the full page, so that readers could scroll around and examine for themselves, but sadly this does not seem to be possible. It is unlikely that a humanist copyist would have removed the numerals, so I think we may take it that they were not present in the ancestor copies either. But here is the rub: the “titles” are not the same. In the contents, the first title is “de forma eius” — “concerning its form” — which references the preceding sentence that indicates the book is about the world. The next title, “de motu”, is the same in both. It is left to the reader to determine where, if anywhere, the break should be. The paragraph breaks, the initials, do not relate to the chapter titles, then. But … were the marginal chapter titles even present in earlier manuscripts? Or were these placed where they are by the humanist copyist? In book 1, which has no chapter titles, we find what are plainly renaissance glosses, highlighting a mention of Cicero, for instance, written in the column to the side. Similar notes seem to appear later: on f.22r there is a marginal note “pythagoras”, written as if it was a chapter title. The answer to this must appear from looking at more, and older, manuscripts. All the same, we do see that numbering chapter titles in the body of the text was not something that just happened naturally, since these have none. They seem, indeed, more like “headings”, indicating content, than chapter divisions as we would have them. And indeed, “capituli” is precisely that … “headings”! Perhaps we should take the Latin more seriously, and modern habits of book making rather less so. I think a lot of it was according to the copyist’s idea of what a book was, and how plentiful the materials were. A lot of early Irish books only provided margins to keep the text on the edges unsoiled; they were trying to stuff as many lines per page as possible. Then you get stuff later on when you have more sheep to play with, and everything’s all pretty and arranged, with plenty of white space. Greco-Roman mss probably had similar imperatives; people being cheap cram it all in, but elegant editions probably didn’t. Also, tags hanging off scrolls may have been a factor. If you have to cram things in, you write the headings as part of the text, with maybe some kind of red ink or symbol to set it apart for easy section finding. If you’ve got big margins, you can use the margins. Perhaps so. What we need is hard data on all these things, and my feeling is that the scholarship has yet to be done. Especially since you’d think it wouldn’t take as long to get data for individual mss as to actually read and translate one. It’s just an evolution of what people have already done with manuscript descriptions in catalogs. So it’s a very broad thing to be interested in, but it’s not as deep a slog as some topics. Probably the most important thing would be to figure out which old books had old manuscripts, and look at them first and compare what’s going on. Greek, Latin, various other languages… all grist for the mill. It’s a great topic for somebody who likes nosing through libraries. Actually, it might actually be something that bibliophiles and collectors might know more about than scholars, because manuscript description (and detection of fakery) is so much more a thing for them. That’s an interesting way to look at it! Yes, it really might not be so big a task. I hadn’t realised that. You see, there are microfilms of a vast number of manuscripts at the Institut de recherches et histoire de textes (IRHT) in France. Simply skimming a certain number of rolls would be perfectly possible to do in a reasonable period of time. 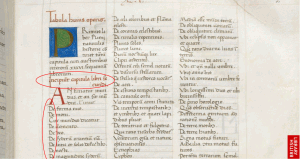 There are lists of old — really old — mss of Latin texts, those before the 8th century. Ancient books are actually few in number. Hmm….